John Robert Stewart Higgins is now the Senior Grand Chaplain of the Grand Lodge of Massachusetts. A Mason for over thirty-seven years, he is active in the Grand Lodge. York and Scottish Rites and has been a Grand Chaplain for more than ten years. It should be noted he was one of the group of Grand Chaplains who were absent from the Quarterly Communication in June 1995. and a few days hence there was a rainstorm of ark-building proportions at the Grand Master's Country Fair. In his and their defense, another Grand Chaplain commented, "we are in sales, not management!" From his name it might be correctly surmised he is of Scottish and Canadian descent and those of you who know Scotland and the Maritimes realize that rain is a normal part of every day. The Rev. Dr. Higgins was born in Montclair, NJ. While in Montclair Academy he was active in the Boy Scouts, attaining the rank of Eagle, as well as in DeMolay and the church youth group. It was while working for the God and Country Award that he decided to consider the ministry as a vocation. At Bates College in Lewiston. ME. he earned an Honors Degree in Psychology in 1961. There followed Masters' Degrees in Divinity (1964), Sacred Theology (1965) and a Doctor of Ministry (1972), all from Andover Newton Theological School. He was an Associate Chaplain at Boston City Hospital and later became a Certified Supervisor in the Association of Clinical Pastoral Education, an organization responsible for hospital and community based training for most theological students in this country. 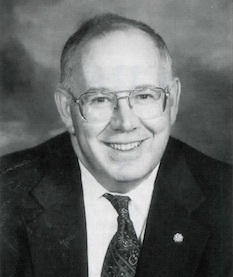 He served as its Northeast Regional Director from 1976-1990. He is a Diplomate of the American Association of Pastoral Counselors and currently is Chair of the Association Budget and Finance Committee. Ordained in the United Church of Christ in 1964 in New Jersey - John Robertson, a Past Grand Chaplain, participated in his ordination service - he now has standing in the Episcopal Church and is active in St. Mary's Parish in Newton Lower Falls. He attended the Graduate School of Education at Harvard University and received his Doctorate in Counseling Psychology from that school in 1970. He took what he assumed would be a short-term position as Chief Psychologist at the Hogan Regional Center. Department of Retardation - a position he still holds. He was one of the first to be licensed as a psychologist in Massachusetts (the licensing statute was enacted in 1973). He is a Designated Forensic Psychologist in which capacity he does court-ordered competence to stand trial and criminal responsibility evaluations. 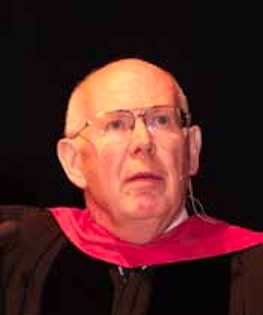 He was a Lecturer in Pastoral Psychology at Andover Newton from 1976-1995 and still conducts psychological assessments of candidates for ministry for a number of Protestant denominations. Bro. Higgins was Raised a Master Mason by J. Philip Berquist, then Secretary of Dalhousie Lodge in June 1963. As time allowed he served as Associate Chaplain of the Lodge. He served as Worshipful Master in 1984-1985 and later as Chaplain until 1996. He is affiliated with The Masters Lodge in Newtonville and Norfolk Lodge in Needham. He joined the York Rite in 1981 and was Commander of Gethsemane DeMolay Commandery in 1985-1986. He affiliated with St. Bernard Commandery in 1998 and is an Associate Prelate. Scottish Rite has a central role in his Masonic life. Receiving his degrees in the Valley of Boston in 1971, he became active in Boston Lafayette Lodge of Perfection serving as Orator in 1992-1993. He was appointed Prior in Massachusetts Consistory in 1991 and is an officer in Mt. Olivet Chapter of Rose Croix. He was coronated an Honorary Member of the Supreme Council, Thirty-third Degree, in the Ancient Accepted Scottish Rite, Northern Masonic Jurisdiction in 1996 in Boston. He serves on the Board of Governors, a former Chairman, of the Scottish Rite's Greater Boston Learning Center for dyslexic children. He was appointed a Grand Chaplain of the Grand Lodge in 1989 by M. W. Albert T. Ames. In 1995 he was nominated by M. W. David W. Lovering as Grand Representative from the Grand Lodge of Arkansas near our Grand Lodge. At the September Quarterly Communication M. W. Fred Kirby Bauer presented the Senior Grand Chaplain with the Henry Price Medal, the premier award given by the Grand Lodge. He says, "I had the wonderful opportunity to further learn the meaning of pastoral care from R. W. Oscar A. Guinn, Jr. as my mentor." Throughout these years he has enjoyed the love and support of his wife of thirty-eight years, Barbara, whom he met at Bates College. They have two daughters. Sharon, who is teaching French in Billerica and completing her doctorate in that field and Lynn, who has a Master's Degree in Library Science and in Criminal Justice who is working in information management in Boston. It is reported that whilst at times a stranger to them, the family still recognizes him as a family member when he is at home. This page was last modified on 23 September 2016, at 07:02.